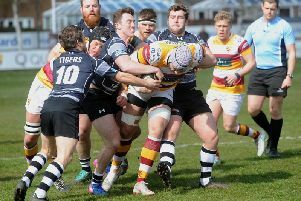 Fylde rugby club player-coach Paul Arnold faces suspension after being cited for serious foul play by National League One rivals Coventry, an offence for which he has apologised profusely, insisting it was out of character in a 400-game career in which he has never been sent off. The flashpoint incident happened at Coventry on October 15 when Fylde lost 53-24. Arnold, who is missing tomorrow afternoon’s clash at Blaydon pending the disciplinary process, admitted he had been ‘stupid amd reckless’ and that he had apologised to Coventry. The contrite Fylde player-coach added: “I am not proud of what I did. I got an elbow in the face and I reacted. “I thought at the time that I had been deliberately elbowed, but I have looked at the video since then and I realise that it was not the case and what I did does not look good. “I wanted to give the player a warning shot for hitting me with his elbow by going in with my knee. “The Coventry player was not hurt, but I shouldn’t have done what I did. “It is not in my nature to do something like that and I have already been in contact with Phil Maynard (Coventry managing director) to apologise to everyone concerned at the club. Fylde are now awaiting a date for the disciplinary procedure to take its course.